Ah, perhaps we're all artists on the inside. We flirt with madness with a wink and a smile. B. Kliban said it better. Remove "beauty's miser" and you have the politician. Pursuit and capture of beauty is the crucial thing. Wasn't he married to Virginia Wolfe? Ok, I have no frickin' clue what Wolfe meant by this... now serve up the meatloaf, I'm hungy! I think Grumpus is right - dump the "beauty's miser" and you've got a politician. 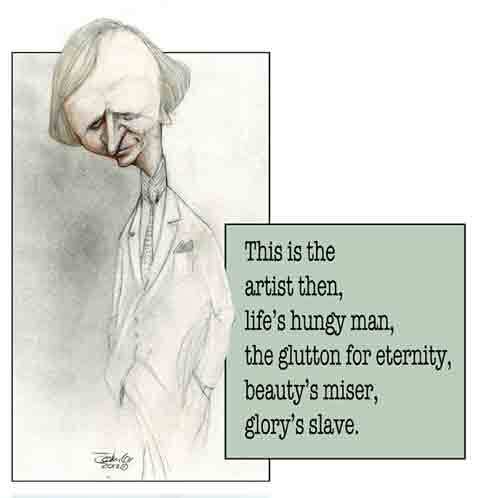 That's what confused me about Wolfe's quote - I couldn't resolve the beauty's miser vs. the gluttony and hungy bit. Watch Amadeus. While an aural artist, the character of Mozart (which was exaggerated for the screen) as depicted is a good literal representation of the quote. This page contains a single entry from the blog posted on April 11, 2012 2:37 PM. The next post in this blog is We ARE John Cox.